There's a unique situation along US 52/US 119 between Nolan and Williamson, W. Va. The highway enters Kentucky twice, but other than a sign which reads "Pike County Kentucky" and the fact that the speed limit drops from West Virginia's 65 to Kentucky's 55, you'd never know you had entered another state. The road was built and is maintained by West Virginia, including signs. In each small section where the road enters Kentucky, there's a connector road to KY 292, which runs parallel to the Big Sandy River on the west side of the stream. The "To KY 292" signs (top photo) are manufactured to West Virginia standards (sorry for the crappy photo quality), but at the southernmost approach on northbound US 52/US 119, the sign is for WV 292. Although technically this is a mistake, I suppose it can be forgiven because the sign was manufactured for the WV DOT. Before and After: The sign assembly on the left was photographed in December 1997 at Logan, W. Va. It shows how a WV 10 marker was incorrectly signed as a County Route 10 sign. (The "CR 10" and US 119 signs on the left-hand side of the assembly look brighter because they were newer than the other signs). 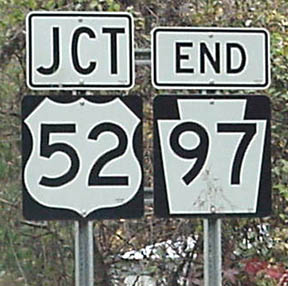 It's even more unusual because West Virginia does not typically use stand-alone signs for its county route markers.On the right is the way the sign assembly looked in November 1998. The incorrect WV 10 marker was removed sometime between December 1997 and November 1998, and the US 119 signs were replaced with a single "To US 119" indicator because US 119 no longer runs through Logan, but instead bypasses it to the north and west. This is not a KY 34 sign. It's located at the end of the exit ramp from I-64 westbound at the Hurricane exit, Exit 34. in West Virginia. It should be a WV 34 sign. The sign at the end of the eastbound exit ramp is correct. 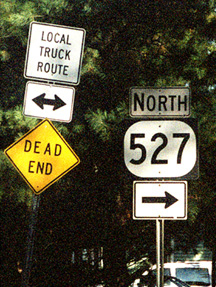 This sign incorrectly marks the end of WV 75 at US 52, south of I-64 near Kenova. In reality, WV 75 multiplexes with US 52 to I-64, then continues on and ends at US 60 in downtown Kenova. No, they haven't extended US 52 into Pennsylvania. These are supposed to be WV 97 signs. These contractor-installed goofs are located in Wyoming County, and the assembly at right should actually have a "JCT WV 80" sign, as well.